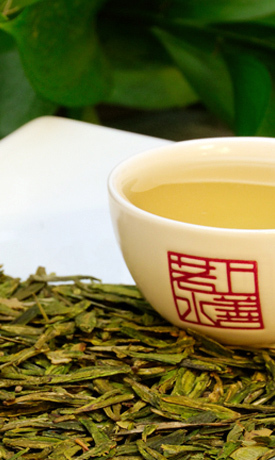 Among all Long Jing, those harvested from Shi Feng (Lion’s Peak) are considered to be of the highest quality. Sword-like in shape and luscious-green in color, each Long Jing tea leaf looks like a carefully handcrafted art piece. Bright and delicate, the sweet aroma of the tea leaves is most inviting. The Shi Feng Long Jing has a mild-bodied flavor that is succulent and pure. The texture of the tea is exceptionally smooth and the aftertaste is very floral. You will find every aspect of this tea peaceful and relaxing. The moment I opened the tin of this tea, I knew it was special… so special, in fact, I decided to get out my gaiwan! I only do that for teas that are deserving of it. And this one certainly fits the bill. I am really enjoying this tea. It is a very light tea – light bodied and light in flavor, and it brews to a very light yellow-green color. But even though I describe it as light in flavor, do not mistake this as me saying that this tea is lacking in flavor in any way – because it is not. It is very lovely and complex in flavor; it is just not heavy tasting. It has a very fresh taste that is pleasantly sweet. On Steepster, I referred to the flavor as “honey roasted nuts” because it has a honey-esque sweetness to it, as well as a slight roast-y, toasty note and a nutty quality to the flavor. I can even taste hints of butter and the floral note in the finish that the Tea Valley mentions in their description. Overall, this is a very lovely tea. I would recommend this tea to those who might find most green teas a little off-putting because of their strong vegetative characteristics, because I am not getting very much vegetal taste to this at all. No grassy flavor, no steamed, buttered or boiled vegetables. No bitterness and no astringency. Just a pure, sweet taste that is so delightful that it will have you coming back for more. And that’s a good thing, because these leaves can be infused many times with no loss in flavor.